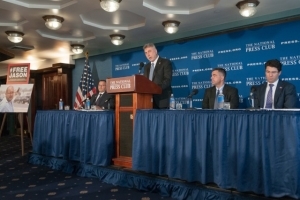 Washington Post Executive Editor Martin Baron calls on Iranian authorities to release reporter Jason Rezaian at a National Press Club news conference, July 22, 2015. Baron was joined at the dais by Jason's brother Ali Rezaian (left) Vice President and General Counsel and Labor Jay Kennedy (center right) and David Bowker, a partner at Wilmer Hale. The 38-page petition was filed with the UN Working Group on Arbitrary Detention, which reports to the UN General Assembly's Human Rights Council. David W. Bowker, representing the Post and Rezaian's family, said later that if the Working Group acts quickly, Iran would have 60 days to respond. The five-member Working Group is chaired by a representative from South Korea with other members from Mexico, Benin, Norway and Ukraine. "Urgent Action Requested," the petition was headlined. The petition makes three legal arguments. It said the Iranian government detained Rezaian, Tehran bureau chief for the Washington Post, because he exercised his right to freedom of opinion and expression, freedom of association.and freedom of participation in public affairs. And it said the Iranian government failed to inform Rezaian of the charges against him, deprived him of his right to counsel, denied his right to prepare a defense, violated his right to a presumption of innocence and impeded his right to trial without undue delay, failed to provide an independent and impartial tribunal and failed to provide a public trial. Rezaian's brother Ali appeared at the packed news conference along with Bowker and Post executive editor Martin Baron and general counsel John B. Kennedy. Boxes full of signed petitions were stacked beside the panel. Press Club President John Hughes said the club had not counted how many signed the petitions, but had forwarded them on to a central point where 500,000 in all have been collected. Ali Rezaian said the lengthy nuclear negotiations with Iran had "complicated" the efforts to win release of his brother, but he told a reporter later that now that a nuclear deal had been reached, "there is one less excuse" for the U.S. government not to press harder for Rezaian's release. "We've always wanted Jason's case to be considered on its own," Baron said. All of the speakers said that Jason Rezaian had done nothing wrong, yet during the past year he has been held in isolation, deprived of medical attention, subjected to threats, and for months prohibited from hiring an attorney. Baron said Rezaian's two-month trial now is a "sham trial on trumped up charges." Bowker said the petition had not been made earlier because there had been hope Rezaian would be released. Baron acknowledged, "We can't speculate when Jason might be released." Ali Rezaian, who works full-time toward his brother's release, said it was difficult to know whether his brother is aware of the extent of the efforts to get his release.